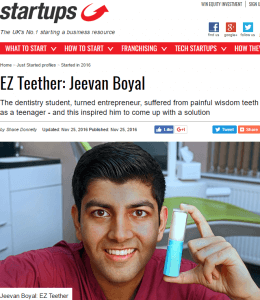 Since we first announced the development of the EZ Teether product, we’ve gained some pretty varied UK media coverage. Women’s Fitness is one of the top women’s health, lifestyle and health glossies. Over the years Women’s Fitness have published several articles around oral health and surrounding topics. 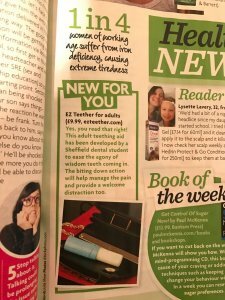 They featured us recently in their “Health Wrap” section, which catalogs the latest health and wellbeing trends and products. 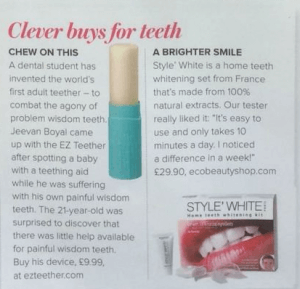 Woman and Home are another monthly glossy to feature the EZ Teether, which they selected for their “clever buys for teeth” section. 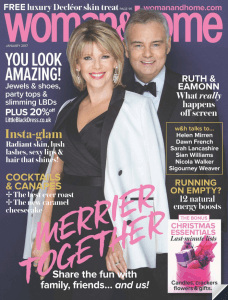 Their magazine has been printing since the 1920’s and reaches hundreds of thousands of people per month, we’re over the moon to be included! 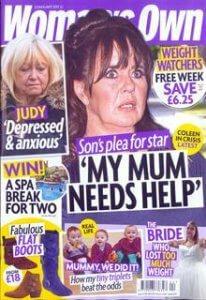 We also featured in the health section of weekly mag Woman’s Own. Startups are a UK online resource that provide insights into new businesses, start-ups and entrepreneurs. You can read the full article on the Startups site. If you would like to request a sample of the EZ Teether for media purposes or would like to be included on our press list, please contact us.